We’d love your help. Let us know what’s wrong with this preview of Hot Flash Sonnets by Moira Egan. Poetry. Women's Studies. Poet Moira Egan finally turned fifty, and her poetic journey has gotten ever sweatier and sexier. In her latest collection, HOT FLASH SONNETS, she explores the sultry joys and humorous indignities of becoming a woman of a certain age. To ask other readers questions about Hot Flash Sonnets, please sign up. I love Moira Egan and the graceful humor of her sonnets. Also, I love sonnets. 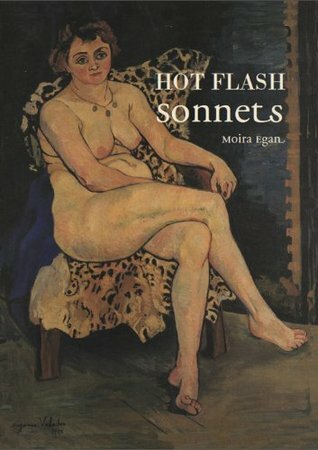 Impassioned sonnet virtuoso Moira Egan makes a magnificent obsession of the passing of the menses in Hot Flash Sonnets. Lusty candor is here galore—if the Wyf of Bath were reincarnated as a sonneteer, she would be Moira Egan—but it’s the skill of this poet that dazzles, for she turns her stunning sequence into a vast landscape, contouring matters of beauty and aging in divinely controlled lines. I really loved this collection of theme sonnets. The format and design of the book was beautiful. The sonnets are great. This is a great collection to read cover to cover, and one to come back to read from. I haven't read a lot of poetry this year, so I really enjoyed reading it. Poetry for aging chicks. Yeah! !